Watch the speedometer unless you want to get pulled over. It easily goes from zero to seventy-five with little effort. If you're not used to the car, you could find yourself driving 110 in a 75 zone on the interstate and not notice... unless there are other vehicles around, then you'd wonder why they were all driving so slow because you're passing all of them! I purchased my vehicle used. It was 6 years old at the time and I've had it now for 6 years as well. It's been missing the visor on the drivers side, which is annoying, but I never thing to replace. The passenger back window doesn't roll down anymore, but I want to fix the tiny oil and coolant leaks before that. Also, the air conditioner has never worked. It's the 3.9 liter engine, so I'm spoiled. Every time I drive another vehicle (i.e. designated driver, when my car is at mechanics) I wonder what's wrong with it and why it accelerates so slowly, and then I remember! Dislikes would be Lithia Motors out of California keeps sending me letters trying to purchase it from me, and also, there's been an ignition recall for 4 years that I can never figure out who to contact to get it fixed. Great and easy car to maintain. 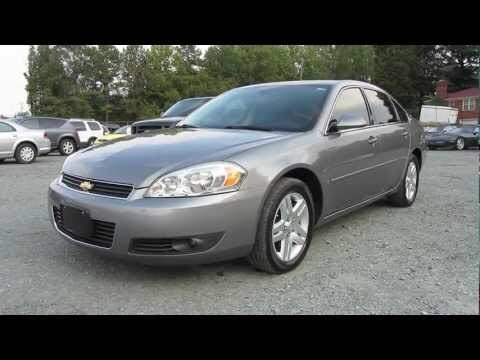 First of all, my 2006 Chevrolet Impala ltz is a great car. It is plenty of room and plenty of trunk space. Secondly, it comes with a spare tire and jack in the trunk compartment. This car runs very smooth and is relatively good on gas as well. The parts for this car are not expensive and some maintenance can be easily done by anyone with the right tools and knowledge of the car. The only flaw that I personally have with this particular car is that it is a full size car, meaning that it is a little longer than an average car. Other than that, this is a really great car and I would recommend this to anyone that is thinking or looking into buying one of these rides. Sporty & fun to drive, for the family! The engine sounds race-y which initially caught my hubby's attention. It runs smooth, not loud inside at all. The seats are comfy and the interior is roomy enough to handle our family of four and our shopping trips! We have enjoyed that it has not had mechanical issues. We keep it serviced regularly and are certain that it will keep us on the road, problem free for miles and miles and miles! The only thing I can think of that has ever been an issue for me is the right rear corner does have a blind spot & though it has not caused a crash for me, it is quite possible it could! It's a sporty, roomy car that keeps us going, we love it!